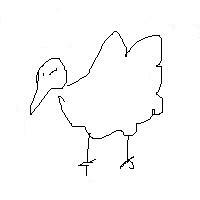 A turkey is not necessarily just a bird, like in the above beautiful drawing. It can be an annoying person, an ineffectual investment, or a failed event. My Turkey Day was then actually a turkey, since I failed to sync my plans and transportation effectively this year and ended up staying home. If all plans worked out correctly, I would have happily gone back, invited myself (and everyone else, haha) to J’s, and have yet another 5-hour-session of vegging with the crew from high school. As an adult now, sometimes these outings are still all I wish to do on a weekend. The Boston weekend half a month ago was the best example, when Team DARKNESSSSSSS (7 S’s), a way-too-ironic attempt to parody an immature bunch of middle school males on Halo 3, was spontaneously born. MZ, DARKNESSSSSSS, took the role probably too literally when he started to solicit girls over the voice communicator, but it was, of course, all role-playing (I think). I am even somewhat thankful that Halo 3 did not allow multiple user names on the same account, which stuck me with DARKNESSSSSSS(3) as my name. It wasn’t about the game, really. I like games, but I never play Halo, so my achievements amount to being a human scarecrow for the team (and my one incredible melee that dispatched a motorcycle rider cleanly out of his seat). It was still all right though, because it was for Team DARKNESSSSSSS. No deathmatches – we were one organism, a team that hasn’t been together in real life for a while: J was actually there instead of being with his female entourage; P, on his poor med student salary and intense med student schedule, was able to make it; against all odds, H showed up, gracing us with his presence from a busy life of weightlifting, botany, or whatever weird thing he is into now. The whole weekend was surreal. We even watched Dead or Alive together and had a hoot, even though it was probably the worst movie I have seen in the past few years (though P swears that Lucky You trumps it). Even the 5-hour rides up and down with P weren’t too bad as a trade for time spent with friends. Of course, back to reality – my plans got jinxed and I would not be able to do any of these things this weekend. I was stuck in Stamford – might as well make the best of it. For starters – I haven’t cooked for myself much since the company subsidizes so much food, so it was a good time to practice. I am also in middle of a couple of books that I never read, so I can kill them off too. Waking up Thanksgiving morning, I realized just how tired I was. Going to New York every weekend is fun, but it is a huge energy sink. Given the circumstances, I decided to stay put in quiet, pleasant Stamford and explore my own thoughts. Staying home, I finally have time for myself, not just my friends. I have work to do; I have to go shopping; I have to run errands; I have to walk outside on a beautiful sunny day with music in my ears, watching passersby along Bedford St; I found a TV show that I have been waiting to watch for years; I improved my lifts; I installed my new laptop, monitor, and reorganized my music library. . .
What about them? They are probably together now, eating good food, bowling, basketball, more Halo, plasma TV watching sports. . . they might even be practicing popping without me (they better not). I even remember last Thanksgiving fondly, though that was when J and I waited outside Circuit City for forever while the guys “accidentally” forgot to come (they were “sidetracked” since they were offered lots of good food at J’s place, so they had to eat – and maybe watch a little TV – but eventually brought us warm food to pay for our troubles). I wonder how long this will all last? It eventually has to stop, right? All I know is that by taking this weekend off and not being with them, I will enjoy the next one more. Christmas plans will be made well in advance. This is what Thanksgiving is about – knowing what to be thankful for. I am actually thankful that I did not go back for Thanksgiving, because it gave me time to think about all of this while wrapping up some unfinished things in my own life. In another one of these cute turns and twists that make life life, I think I just came out of another win-win situation.